The true essence of love can only be experienced when you are in your HEART. Being in your HEART and living your life from a foundation of love is the most profound experience you can have. Only here can you find peace, live in harmony and fulfill your dreams. When I discovered Drunvalo�? ?s work it was like finding a missing key that has empowered me to not only live life from my HEART, but also to be a catalyst for others. 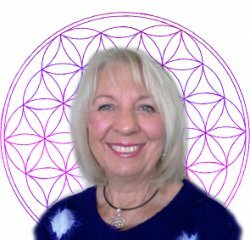 My spiritual path of awakening began some years ago in the 1970�? ?s when I joined a Spiritual/Therapeutic Community and lived there for 10 years. This laid the foundation to become a Certified Counsellor/Psychotherapist. My psychotherapy practice later evolved into many healing modalities including, Rebirthing, Aurasoma, and Auric/Chakra Healing. As a Supervisor for other Counsellors in training, I then moved into teaching Counselling Skills for Health Practitioners and facilitated many spiritual workshops. All was going well until I had a period of illness and so began a journey of self healing. This involved a move into the country where I was able to connect with the great healing power of Mother Earth again and the Ascended Masters. My path then took me into Secondary School teaching where I taught Computing for 10 years and more recently I moved into the role of Senco (Special Education Needs Co-ordinator) in our school. I am a mother to 3 sons and 1 daughter and 1 step daughter. I have also been blessed with 6 beautiful grandchildren. When Drunvalo�? ?s teachings appeared in my life, first as the book �? ?The Serpent of Light�?? and then many YouTube videos, I was guided to attend one of his ATIH workshops. Even before I participated in this workshop I knew in my heart I was being called to teach this knowledge. I have been very fortunate that my husband John has also shared in this wondrous journey to become a Certified ATIH Teacher. Together we bring a dynamic blend of both male and female energies that enhance and bring a balance to these teachings. I am so honoured and privileged to bring you the teachings of Drunvalo Melchizedek�? ?s Awakening the Illuminated Heart. Having experienced my own heart awakening and witnessing this in many others, I am delighted to facilitate this empowering and beautiful workshop. I am happy with final experience. Thank you. Waveney is a lovely woman who lives and breaths compassion. She makes you feel welcomed and loved the moment you meet her. Waveney is totally committed to the ATIH teachings and it shows with her words, actions and teaching style. Waveney answered all the questions we had honesty and with integrity. This was my first ATIH workshop and through this experience I am dedicated to these teachings and live my life within my heart.